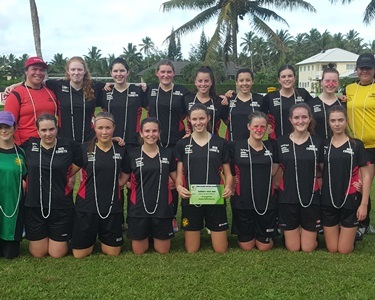 An Under 16 women’s team from Auckland is in the country to learn more about the “island way’’ and experience local football here on Rarotonga. Ellerslie Red Comets are on Rarotonga for a football and cultural experience. The Ellerslie Red Comets team, which is managed by Cook Islander Nga Kairua, played its opening match against a Rarotonga Under-16 selection side yesterday. The visitors who struggled with the warmer climate conceded nine goals for the Raro side at full-time. They will take on Nikao Sokattak on Thursday followed by a match against Tupapa Maraerenga on Saturday. Kairua is no stranger to Cook Islands football having closely worked with CIFA to bring over teams from New Zealand. Last year, he brought the Ellerslie Rebels team to Rarotonga to play friendly matches against the local clubs. Kairua and his team arrived on the island over the weekend and will be taking part in a number of cultural activities while also enjoying a full-on football experience with a couple of club federations on the island.